Is This The Coolest Teething Necklace Ever?! Is your kid teething? (Seriously, when are they not?) If so, we have a product that might help…and boy does she look good. We first discovered Mama & Little teething necklaces on the blog of S.F.-based illustrator and all around cool-cat mom Chloe Fleury. And let’s just say, we were floored to learn that these gorgeous, geometric wonders also double as chew toys for babies and toddlers. Although there are plenty of designs on Mama & Little’s site, our favorites are those featuring hexagon-shaped, 100% food-grade silicone beads, which have a sort of Marni-esque quality, no? 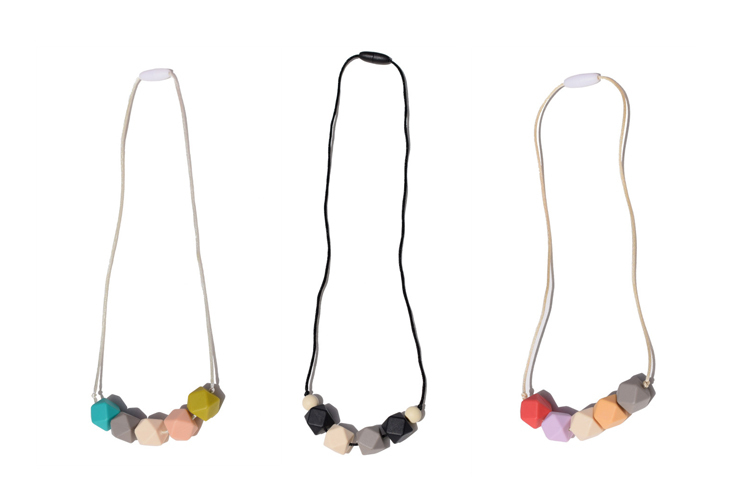 Other teething baubles include bracelets and necklaces with rounded, pearl-like shapes (in a modern rainbow of hues). The best part? Prices range from $8 to $20. Which makes it definitely something we can sink our teeth into.